Curious and candid travel letters from the heart. Catalonia, The Virgin and A Full Moon. 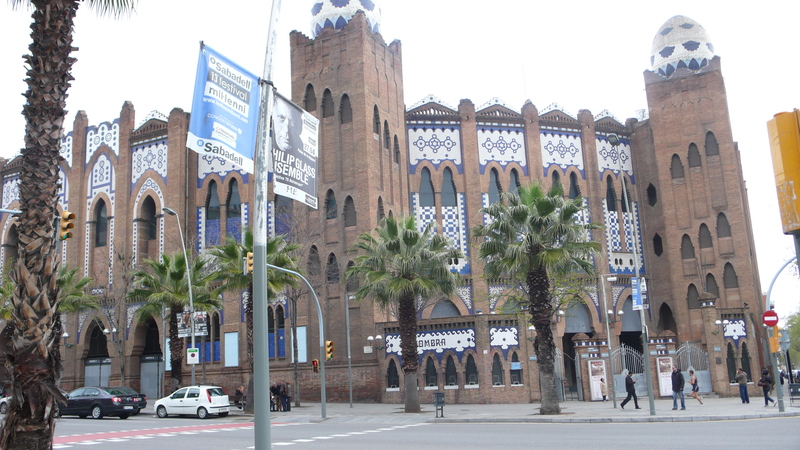 As we head down the street with the church is behind us, I look on the map and notice that on route to the Park we are going to pass a bullfighting arena. Bullfighting, one of the more offensive human past times (in my opinion) has been banned in the Catalan State of Spain. I say Catalan, because it is an important part of the whole equation, we are not really in Spain right now, we are actually in Catalonia or at least that is how the Catalans feel. The history of the Catalans go back centuries and they even have their own language. A good example is that streets signs here a don’t have the word CALLE for street, instead they say CARRER which is Catalan for Street and so on. Remember at church? The service was in Catalan, and they will even try to give you menus in Catalan – which drives the Spanish nuts. The language itself? It is derived from a Pig Latin if you will, a mix of Italian, Spanish and French and was spoken on either side of the Pyrenees mountains. If you look up the history of Catalonia, it is a long one, Andorra, one of the smallest countries in Europe and established in the 1200’s official language is Catalan. It lies between the borders of France and Spain and the Catalan people in these parts are the direct descendants of that ancient world. For 100’s of years as the Peninsula invented itself and principalities divided, a people always get caught. Franco banned the language of Catalan and pretended the people never existed but for years there was an underground movement to keep the culture and language alive and in 1975 the Catalans were freed after Franco rule and have been fighting for their identity since. In the last 30 years, it seems they want to really get it all back and not even speak spanish anymore! 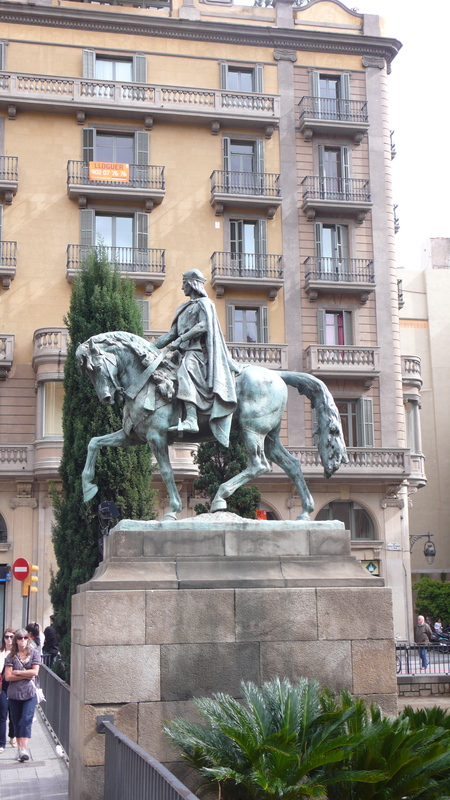 Barcelona is a Catalan City but don’t think you can’t speak spanish… you can. One major way they have attempted to set themselves aside from the rest of the country they just recently BANNED bullfighting. If you are of Spanish descent, you deem bullfighting as a right and an honor for those who spectate it and those bulls and fighters who participate in it. In July 2010 the state of Catalonia passed a vote that by January 2012 – The sport of bullfighting would be officially banned in Catalonia. The rest of the Spain feels that it was a bold move by the Catalans to set themselves apart from a very tradition that the Spanish see as a basis of Spanish culture!!! As we walk by the old arena it sits waiting for its new fate. (Maybe Madonna should throw a concert there? I feel sad. This time I am not sad for a culture to lose a time old tradition, but sad for all the noble bulls that spared their life for a hungry spectator on a weekend afternoon. I could get into it, yes, they fed the meat to the orphans, the bulls have a better life than a dairy cow etc, but for me, it is the very idea that for PURE entertainment, an animal is tortured and killed for the sake of entertainment. It is insane and simply BARBARIC! I feel the world is a much more civilized place without it, at least Catalonia is. I am beginning to take sides with the Catalans and consider studying the language! VIVA CALATONIA! My first word is Carrer which means Street. Here she is: Placa del Toro Monumental. As we walk towards the Parc de La Cuitadella we pass under the Arc de Triomf! I told you this was Paris with Palm Trees! And we head down the center towards the Park. It begins to rain. Maybe is was the tears I felt for the bulls or maybe it was just rain… Quietly I think it is the tears for the bulls. To take cover from the rain, we run into the beautiful Estacio Terme o de Franca! (the train station). They have a bar there called what else “The Station” and we find a couch in the corner. After a juice, you won’t believe this but we PASSED OUT and took a 2 hour nap while the rain hit the ceiling of the structure. Can you Imagine? A Nap? It was purely heaven and when we were through? We got up, and kept going! With only a few hours left we decide to grab a Beer and a Salad and plan our final hours. Princesa 23 is a great place if you want to take a break from Manchego and Ham. Here we found a delicious light meat free meal and it is right downtown, which started to get pretty busy! 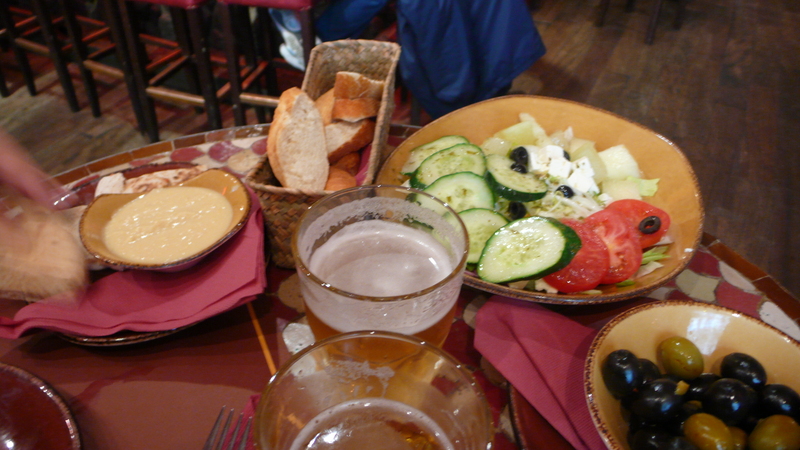 Veggies and a Refreshing beer. Perfect! From there, we walked along the Marina and the city was BUZZING! 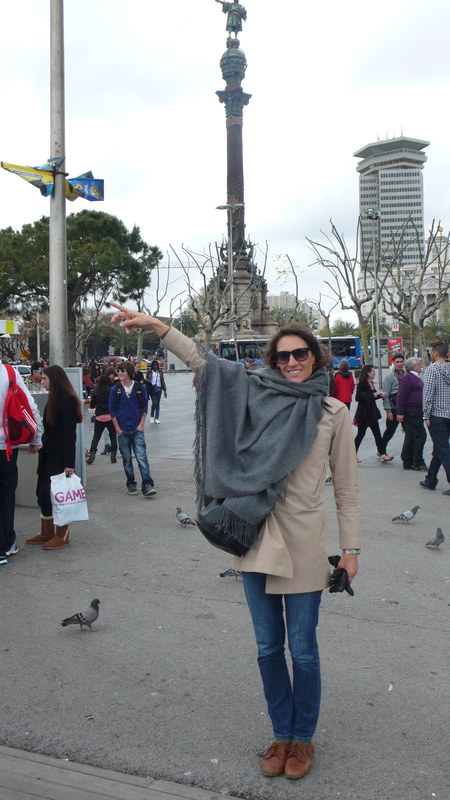 Beautiful buildings, monuments and people! 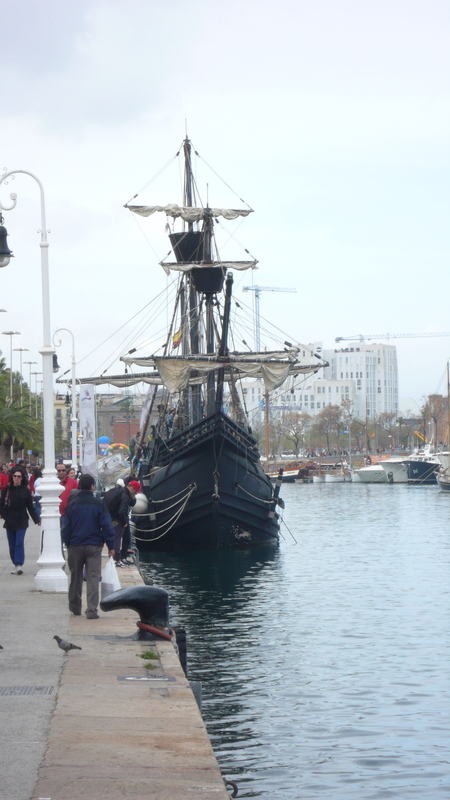 This boat is a replica and just returned from an around the world sail! Me and Christopher, Pointing to the New World! As the day starts to come to a close, we have a few things left we want to do! #1 go buy cookies at the famous cookie shop! 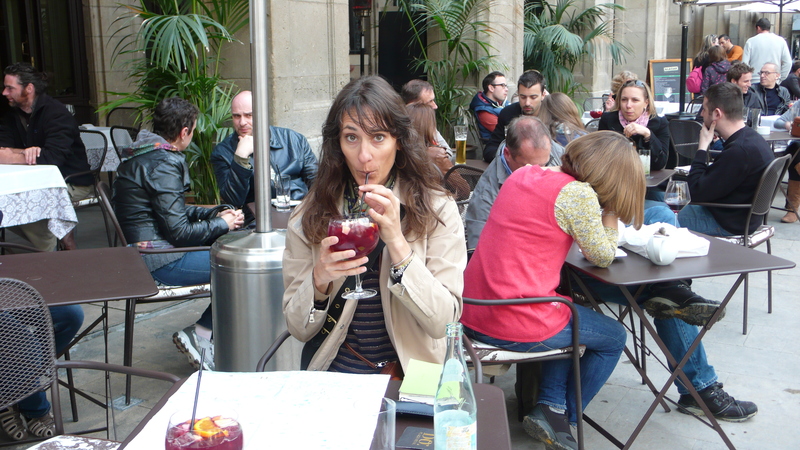 #2 get a sangria and #3 eat a paella. We manage to get all 3 and more! 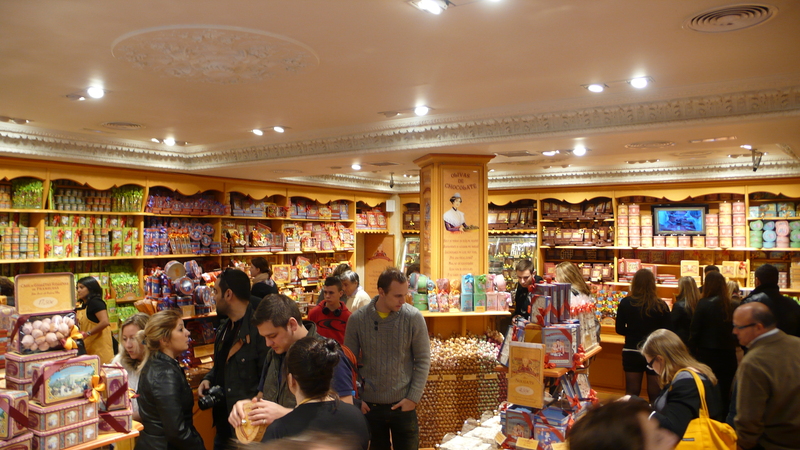 I don’t have a sweet tooth and even I went crazy for this haven of fresh cookies and candies called “La Cure Gourmande!” What is so funny is that it is a french joint but it is SOOO good. I stocked up on cookies for my family and even tasted a few items! From Strawberry Cookies to chocolates it is all good! After the cookie purchase we are hit with a huge crowd! 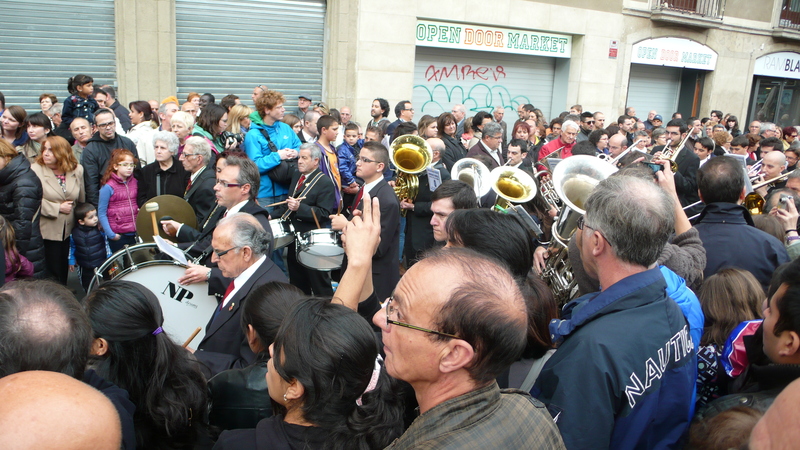 Manuel askes what it is all about and it is for the procession of Mary that is hitting the streets. I get excited. I have never really seen this, actually, and in SPAIN? Opus Dey is alive and well here and I am excited for what we are about to see. 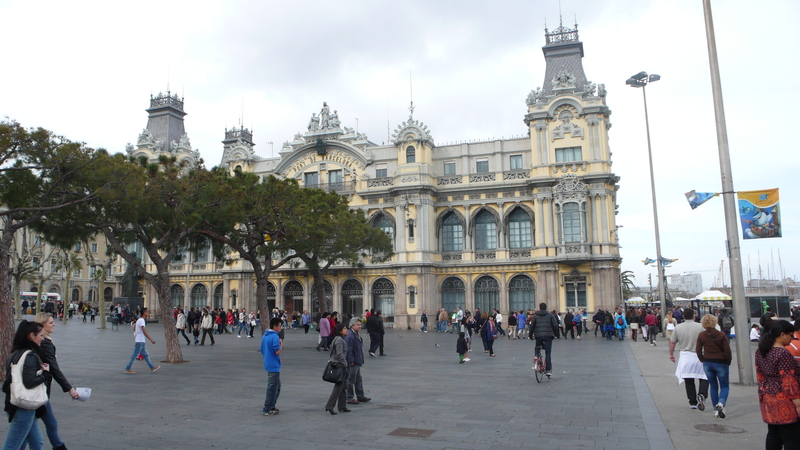 We zip up our pockets and purses because pick pockets are most certainly on the loose, actually pick pockets in barcelona are the norm and you should ALWAY mind your pockets and bags… ANYWAY – we head toward the Rambla and low and behold! There she was!!! 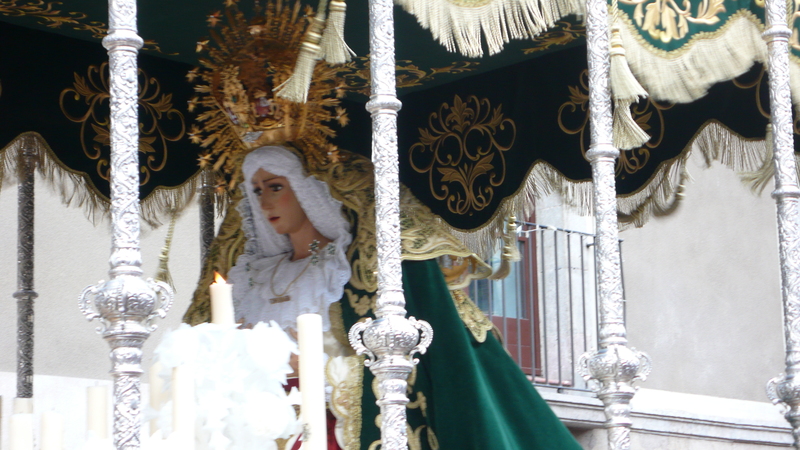 The Virgin Mary. The pious paraders around her were wearing KKK like costumes, ones I have only seen in the movies! 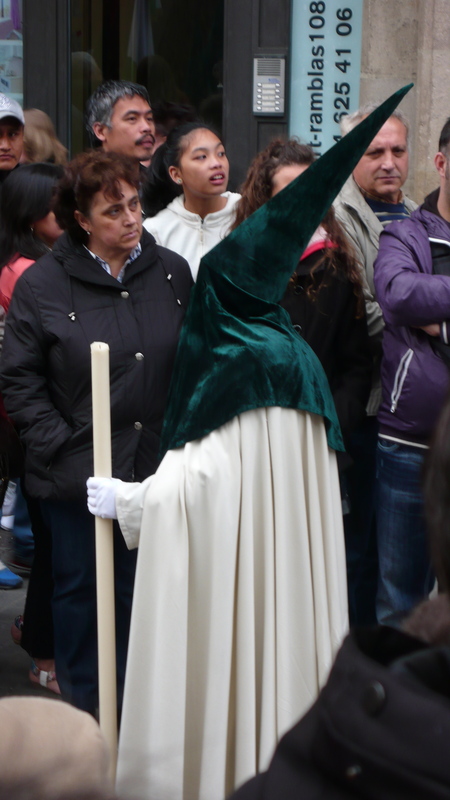 Their dark green cone shaped headress/masks were menacing and freaky? I thought, if you are going to be pious, show your face? Why is it in religion that they want everyone to cover up the body that we were given? To hide? To cover? That never made sense to me! Pious people should run around NAKED! and do it in the name of GOD! 🙂 still we stayed and watched. 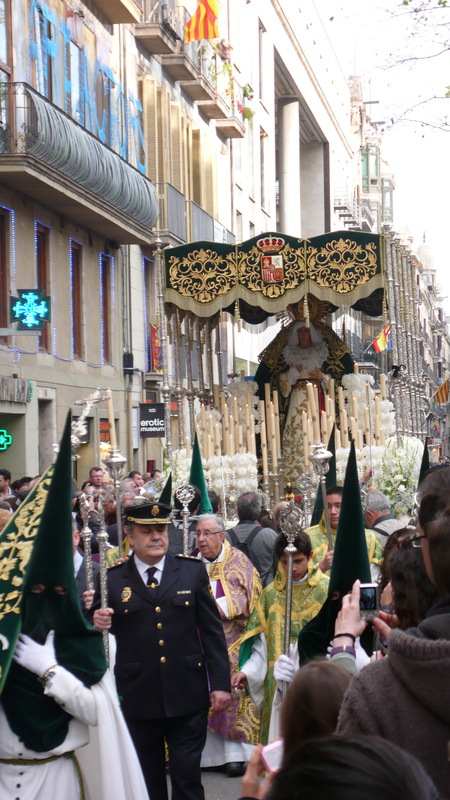 There were processions like these all over town due to it being Good Friday. On the news that night, there was footage of even the most notorious followers that whip themselves into a frenzy emulating Jesus’ walk towards crusifixtion. It is totally insane. I know that if there was a God, he would not ask you to do anything like that. I think he would just really want you to be kind to one another. This example of rightish religion in the end in my opinion is alienating. Religion more and more as I have travelled causes more trouble than peace and it starts to make me a little angry. I picture myself stomping the procession and pulling the hats off the cowards that pretend to be something else. Instead I let them be. I am passionate but not THAT dramatic! + I have not had my SANGRIA yet! We all waited with bated breath and then the music of the marching band began. The float began to shake, backwards and forwards, candles would go out and reignite and the procession began. It was a strange sight. Here are a few pics! Lifelike rendition of the Virgin. The Candles would go out and then Restart. It was Actually a Little Freaky. Afraid to Show your Face? The Leader of the Pack! There were a bunch of these happening around town, after the procession passed we decide with the little time we had left to stop chasing the Virigin and find our other religion! HA HA that is drinking good Sangria! 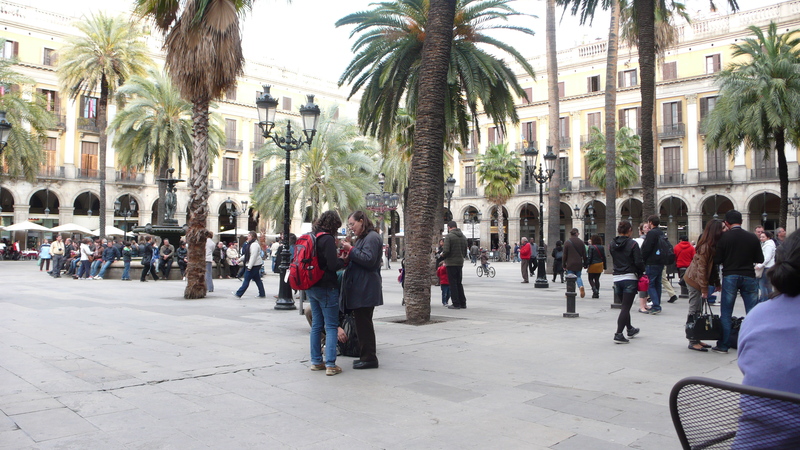 We did so at the famous Placa Reial! This is a favorite spot amongst everyone! We found a seat at DO and ordered 2 sangrias stat! As the world walks by we sit and relax and soak in the last of what day light has to offer. The sangria is delicious and the glass is big enough to dive into. At this point you look around and think. LIFE IS PRETTY GOOD. 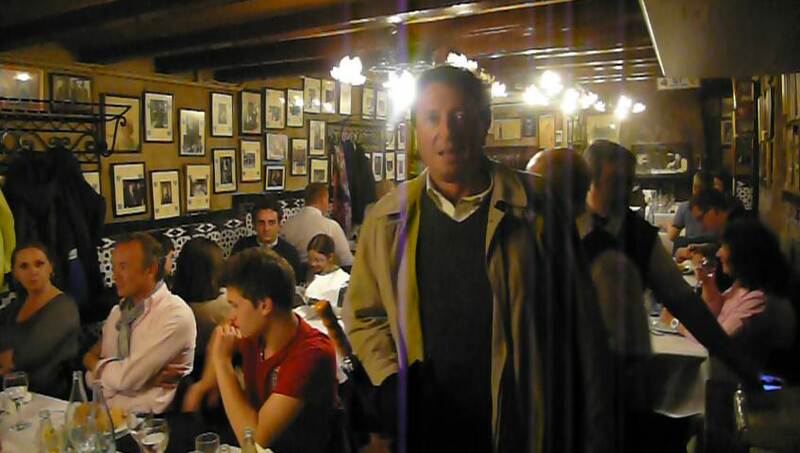 Our last stop today and in Barcelona is the very old establishment of Los Caracoles, which means the snails… you have to walk through the bar and then kitchen to get to the tables and it is filled with tourists and locala. The white coated waiters are attentive and the food selection enormous. 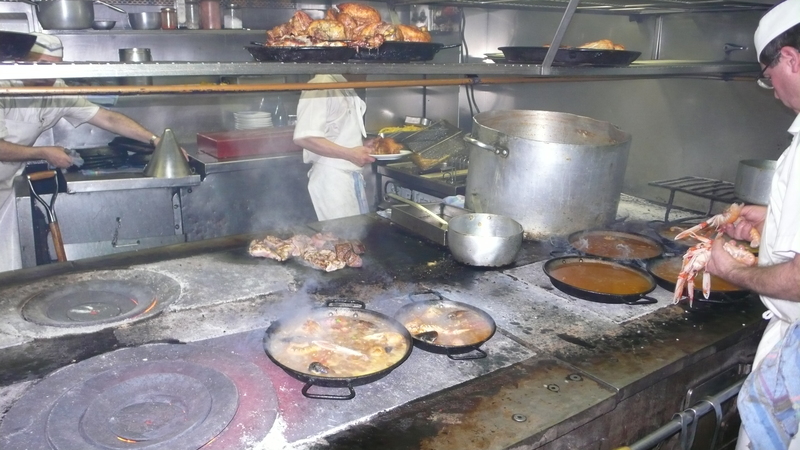 It is good friday and I am thinking a shellfish Paella and Manuel his last order or Solo Meo Beef. After a few glasses of wine and some really good food we are cooked. We leave the restaurant full and happy and start walking towards a good place to spot a taxi. Walking back toward the water front I look to the sky and notice that the moon is sitting just there, slightly above the eye line. Bright and happy I take in the whole scene. 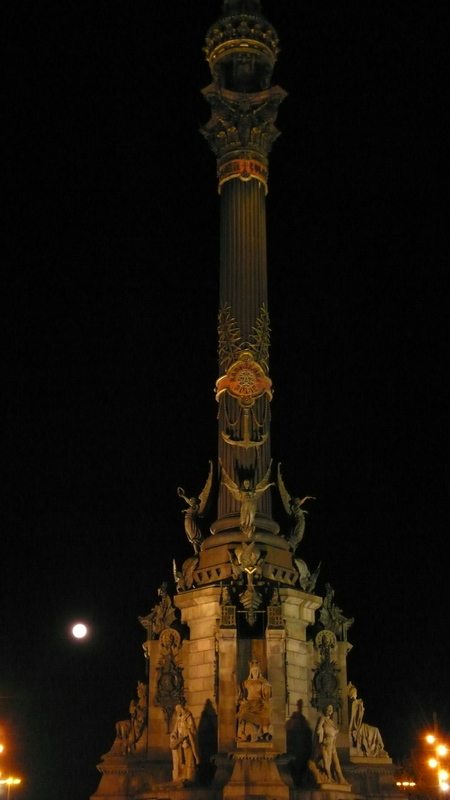 Barcelona – oh sweet city, you have taken me in, embraced me and now are dismissing me with a moon light kiss! Gracias! What an amazing place! I’ll be back soon!